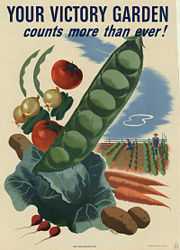 I’ve become fascinated with the resurgence of the Victory Garden. I think everyone has the idea that it would be nice to get your salad from your own backyard, patio, or balcony. And the truth is you can. And people long before us did it. In fact, there was a time our Grandmothers (or great grandmas) were encouraged to do it. With all of us learning more about our food, we realize most of it comes from farther away than we thought. A friend of mine has frozen organic strawberries from Serbia! I’m sure I have something like that lurking in my freezer. Thinking only about organics, can lead you a long way from home. At a farmers market you can usually get the best of both worlds – local and organic. But not everyone lives close to one. Most chain groceries are starting to label where the produce was grown. But some places have gotten in trouble for labeling non-organic food organic. Sometimes it’s nice to just know what you put in the food your are eating. Before I sound like a seasoned gardener, let me tell you each year I try some new things in the garden. Sometimes they work, other times they don’t. But either way I learn something and have an excuse to spend more time outside. Last year it was raised beds for the first time, and this year I’m adding a bunch of containers to allow me to plant more vining plants like sugar baby watermelon and round zucchini. Could I tell you which plants will make it to my table? Not really. I have a good idea, but sometimes it’s up to the squirrels or the bunnies to decide for me. I’m just a brave newbie, not a master gardener. If I can manage to do it you certainly can. There are some great resources on the web and one of my favorites is You Grow Girl. There are great articles and tons of forums for any location or interest. There are even grow alongs where everyone agrees to grow a certain item and talk about it. The Garden Girl is a great source for how to videos and she is in an urban area to boot. She does more in her urban garden than I thought possible. It has inspired me to think of ways to better utilize the space I have. 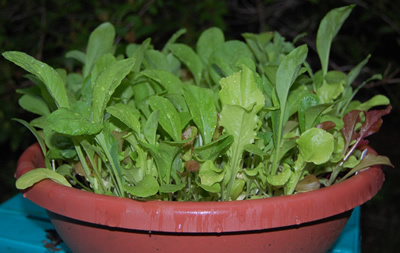 At the very least you can grow a “salad bowl” in the smallest of spaces. Organic lettuce can be expensive and it goes bad quickly. Lettuce growing in a bowl is cute and you can cut 1/3 of the height of it, make a salad, and in a few weeks it’ll grow back and you’ll have some more! This will keep happening until it “bolts”, or tries to go to seed. Once this process starts the lettuce will be to bitter to eat. To delay this you may need to put it in the shade once the temperatures stay above 80 degrees, so the heat doesn’t trigger the bolting. This article from the Washington Post explains this more thoroughly and gives you some ideas on how to prolong your harvest. You can either drill holes in an old wooden salad bowl (try thrift stores), or get a bowl shaped planter – they are shallow so you don’t need as much dirt. All dirt is not equal and you will need to go buy some potting soil. At the store they will sell top soil, garden soil, etc – but potting soil is created to hold water a little better, because containers dry out faster than something that’s in the ground. So make sure your bag says potting soil. You can make your own if you want, here’s an article with soil recipes. And nowadays you can find organic potting soil even at Lowes or Home Depot. 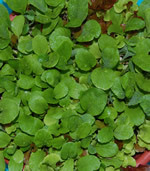 You can get some mesclun seeds (A blend of different salad seeds mixed together) or other loose leaf lettuce. You can find these at any drugstore to gourmet online stores like Cook’s Garden. If you choose to order your seed, try to get a variety that is more heat tolerant like Red Sails. That’s the variety I’m trying this year in my raised beds. The Cook’s Garden lists the varieties by season. So now that you have your pot, fill it with your potting mix. 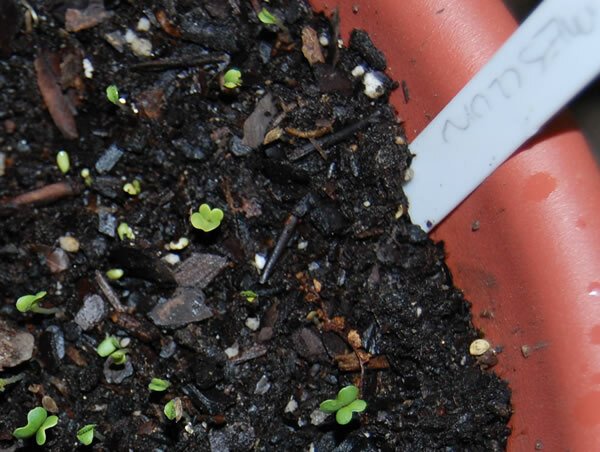 Liberally sprinkle your seeds in an even layer across the pot, then cover with a little more soil and water gently. You will need to keep the soil moist while you are waiting for the seeds to germinate. It took about 10 days before most of mine sprouted up, but it won’t be long till that will be my dinner. And there is nothing better than eating salad that you grew yourself. My friend asked where she can get locally grown produce, and how she could find farmers who don’t use pesticides or are certified organic. She lives close to Raleigh. There is a nice farmer’s market in Raleigh, but I don’t know as much about the farmers that sell there. First, ask the farmer who’s selling at the booth. S/he will know and can tell you what they use . In both Durham and Raleigh’s farmer’s markets, a farmer would have to have their organic certification to use the word organic. In Durham, some booths say that they do not use any pesticides. But remember organic does not mean the plants have not been treated at all, but they can only be treated with certain natural pesticides. Maple Spring Farm in Cedar Grove, NC has an interesting post on that subject. You could start at the Growing Small Farms website and see if there are any farms near you. Also Eat Local Triangle has a listing of market’s on its website. One of those links, Local Harvest is a great tool for finding food near you in the US. Using her zip code I found that there were a few cool farm’s nearby. Including Kidd farm (veggies), Spain farm (mushrooms), Double-T (veggies) just to name a few. Another way would be to do some research on the CSA’s in your area. In a Community Supported Agriculture (CSA) you would buy a share ahead of the season, and then you would get a box of food each week for the number of weeks you signed up for. You will most likely not be able to pick exactly what you get, but you are going to get some super fresh food and the opportunity to learn about a few veggies that you might not have tried. Many CSAs are already sold out at this point in the season, but you may be lucky enough to find one that isn’t. Many of the farmers in the area sell to Whole Foods or Weaver Street Co-op, so that’s a possibility too. Those stores list where the produce was grown. I find that I can get a better variety right at the farmers market myself. and it’s nice to see who’s growing your food. Our local weekly, The Independent, has a section full of local food information this week. It seems that alot of people want fresh produce, and to support the local farmers so they can grow more. In fact, my market is open for the first time on a Wednesday – I may just have to stop by.